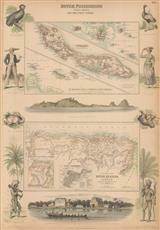 Description: Miniature map of Puerto Rico and the Lesser Antilles. Coloured. 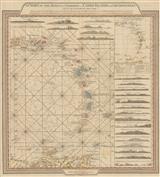 Description: A striking sea chart with decorative cartouche and compass roses. Black and white. Description: Lesser Antilles. Grenada, St. Vincent and the Grenadines (Including Mustique and Bequia), St. Lucia, and Barbados. Original colour. 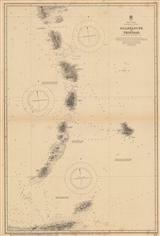 Description: Leeward and Windward Islands. 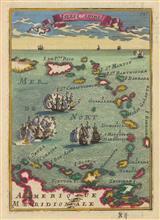 Uncommon and iconic sea chart with fine original colour. 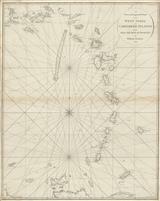 Description: Three maps on one page showing St. Lucia, St. Kitts, and Nevis. Elegantly engraved with delicate hachuring to show relief. Original hand-colour. Description: Suriname and the Dutch Caribbean islands: Curacao, St. Maarten, Aruba, Bonaire, and Saba. Vignettes of local costume and native species. Large views of Curacao and a cocoa plantation in Suriname. Original colour. 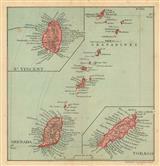 Description: Three maps on one sheet of Grenada, St. Vincent and Tobago in printed colour. 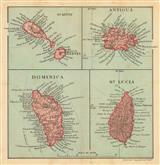 Description: Four maps on one sheet of St.Kitts, Antigua,Dominica and St. Lucia in printed colour.